Uppinangady, Sep 03, 2014: Even as the district administration and government are initiating action against illegal quarry units, an illegal laterite stone quarrying is being carried out on the periphery of a school premises at Thurkalike in Belthangady taluk. The quarry is adjacent to the compoud wall of Dakshina Kannada Zilla Panchayat Government Higher Primary School. Quarry pits have been dug all over, posing threat to the lives of the children who study in the school as well as residents of the area. The laterite stone quarry is on survey number 28/1 p1 in Karaya village of Thanneerupanta gram panchayat and spreads over 1 acre land. The villagers say that the land was earmarked for the construction of house for poor who do not have a roof over their head. However, the reserved land is used illegally for extracting laterite stones. Large noisy machinery are used in the quarry site to cut stones, said sources. Parents of the children who study in the school complained of noise pollution at the site. The noise pollution has been affecting the learning of the students. 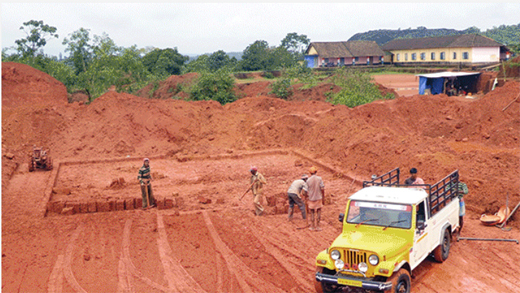 As the laterite stones are extracted, lorries and pick up vehicles visit the site to transport it. The continous movement of vehicles have also been creating noise pollution and dust. The villagers allege that illegal huts have come up on the periphery of the land to store equipment and park vehicles and the gram panchayat authorities are hand in glove with the illegal quarry unit owners, which has also caused illegal movement of uncontrolled elements in the area. Inspite of illegal quarry unit operating in the gram panchayat land, the authorities have claiming that there was no quarry and the land is being levelled to construct houses for the poor. The GP had resolved to give permission to one Adam to level the land. However, in the name of levelling the land, laterite is being extracted illegally, said villagers in a complaint to Deputy Commissioner A B Ibrahim. The villagers have urged the district administration to initiate action against illegal quarry before any mishap occurs in the site. When contacted, Gram Panchayat PDO Shekar said that the land is being levelled to convert it into sites. When asked on permit for quarry, he said that the gram panchayat has not issued any permit. The matter is being covered up extensively.